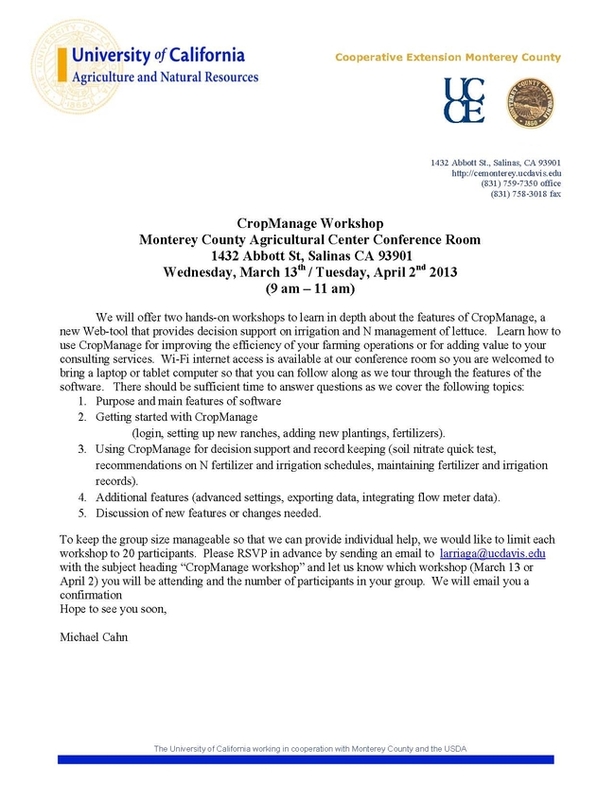 We will offer a hands-on training to learn in depth about the features of CropManage 2.0, a free online decision support tool for water and nutrient management of coastal crops. CropManage was recently revised with a new user interface and additional capabilities, and now supports iceberg and romaine lettuce, spinach, celery, broccoli, cauliflower, cabbage, and strawberries. Considering that the drought may continue into a 5th year, and water quality regulations continue to be linked to nutrient management, efficiently using water and nitrogen fertilizer is a high priority for Central Coast growers. CropManage can be a useful tool for providing quick decision support on water and nutrient management on a field-by-field basis. This training will provide an opportunity to learn how to use CropManage for improving the efficiency of your farming operations or for adding value to your consulting services. To keep the group size manageable so that we can provide individual help, we would like to limit the workshop to 30 participants. If you have attended previous workshops and or feel proficient in using the on-line tool, then you are welcome to just attend the second half of the workshop (10:30-12 pm). Whether or not you plan to attend the entire or part of the workshop, please RSVP in advance by sending an email to larriaga@ucanr.edu with the subject heading “CropManage workshop” and let us know the number of participants in your group. We will email you a confirmation. Alternatively, you can contact our office at 831-759-7370. Thank you, and I hope to see you soon.